Since we returned from the airport, Kaylah has been looking behind us when we come in the door. Dogface knows that Kristina was just here. She is impatient for Kristina to be the next person to walk through the door. Soon, pup, soon. This. So creative. My favourite is the toy with the mouse. You’ll see. 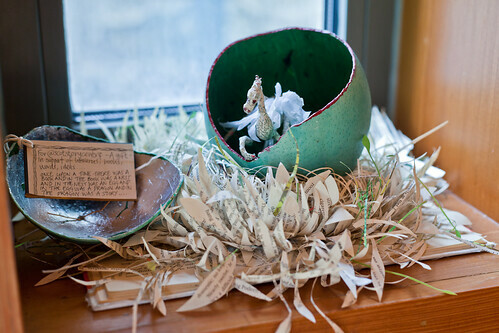 Paper sculpture fascinates me – it is such a seemingly ephemeral medium, vulnerable to the elements. Yet people create amazing, sophisticated art pieces with simple materials + tools and extraordinary imagination. Why is it that something so simple can be so sublime? I know making it was not simple but its simplicity makes it grand. Slightly teary because I felt like a soulmate with the little guy and loved how his buddies aided him in taking the journey. Thank you friend this was exactly what I needed this morning.